With your iPad, you never have to be away from your tweetstream. Link your Twitter account into your iPad with these apps and you’ll always be in touch with your Twitter friends and followers. 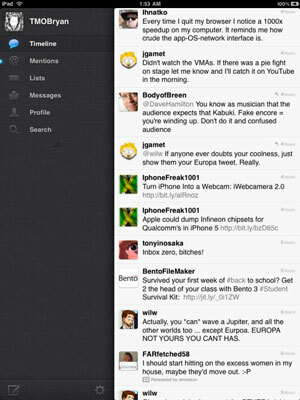 Twitter is a hybrid app for iPhone and iPad. From usability to readability, general layout, and design, it’s a great app. In portrait mode, you get two panels. The left panel has a list of your Twitter accounts with tabs for your Timeline (tweets from you and those you follow), @Mentions, Lists, Direct Messages, a tab for viewing and editing your own Profile, and one for Searching. On the right is a pane for your tweets. At the bottom of the page is a Settings button and a New Tweet button. All those elements are logically laid out, but what sets this app apart is the way those elements can be expanded, pushed, pinched, and swiped — for instance, if you tap one of the tweets in your Timeline, a third panel comes out from the right, squeezing everything over to the left. 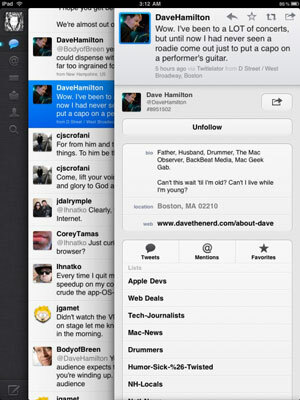 Twittelator for iPad was developed by Stone Design, a company that has been making Mac OS X apps since before it was Mac OS X. And that’s probably why this app has such a nice fit and finish, and why it’s so easy to use. In portrait mode, you get one pane of information and a navigation bar for viewing tweets from your friends, Direct Messages, @Mentions, Channels, Search, Lists, Drafts, and More (Profile, Retweets, Trends, Everyone, and Settings). Other features allow you to follow other users’ Lists, create and manage a queue of Draft tweets, and browse a list of Channels that contain posts about specific topics (Business, Arts, Health, Food, Politics, and more). Tumbleroo is an app for working with Tumblr, the blogging service that bridges the social-networking world. The app includes full support for the Tumblr dashboard (including support for audio and video posts); you can also indicate that you like posts from other users and “reblog” content that bears repeating. Tumbleroo also allows users to manage multiple accounts, create private posts, and send their posts to Twitter. TweetDeck is well suited for people who follow more people on Twitter than they actually have time to follow — or even for people who simply need to prioritize their followers. With TweetDeck’s multi-column view, you can make new columns that correspond to specific people. For instance, if you have some work-related accounts that you need to make sure you see, make a column for them. You can have as many columns/categories of tweets as you need — and simply swipe through them, as needed.